As the chapter opens, Malala has just been shot by a Taliban soldier. The bus driver, Usman Bhai Jan drives the bus as quickly as he can to the Swat Central Hospital. The news of Malala’s shooting spreads very quickly, and within only a few minutes, a local has called Ziauddin with the news that his daughter’s school bus has just been attacked. Ziauddin—not yet aware that Malala was shot—rushes to the nearby hospital, where he’s crushed to find that his own daughter was one of the Taliban soldier’s victims. In this part of I Am Malala, Malala is describing events that she did not, properly speaking, witness. She has reconstructed these events with the help of her family members, her classmates and the various other witnesses to her shooting. Malala has lost a great deal of blood, and there is a large bandage over her head—she’s unconscious. Nevertheless, she has survived the Taliban soldier’s attack. Ziauddin tearfully embraces her, and calls her a brave and beautiful daughter. Seeing Malala in the hospital, Malala later realizes, was the worst thing that ever happened to Ziauddin. Ziauddin was always extremely close to Malala, so to have come so close to losing her forever must have been devastating. Even when she thinks back on her shooting, it’s very telling that Malala thinks of the pain she caused her father, rather than the pain she endured herself. Malala is seemingly so naturally selfless that even when she thinks about her brush with death—an event about which it seems morally defensible to be selfish—she can only think of her family. While Malala lies in her bed, still unconscious, the doctors tell Ziauddin about Malala’s injuries. Miraculously, the soldier’s bullet didn’t damage Malala’s brain at all. Two other students, Shazia and Kainat, were also injured by the soldier’s attack, although their wounds are very slight—indeed, Kainat didn’t realize she’d been injured until several hours after the incident. Ziauddin doesn’t leave Malala’s bedside for even a minute. We learn that two of Malala’s classmates were also injured by the Taliban soldier. It’s a powerful reminder that violence and intimidation always have unintended consequences that weaken one’s. We’ve seen this in both the Taliban’s suicide bombings and the US drone strikes—both of which kill all sorts of innocent people—and here we see it again in the shooting. Tor Pekai has been remarkably absent from the book so far. She is clearly a loving mother and a major force in Malala’s life, but she’s simply not as important in Malala’s campaigns for justice, education, and equality as Ziauddin is. Where Ziauddin can offer Malala connections, advice, etc., Tor Pekai cannot. Perhaps because of this, it’s all the more powerful when Tor Pekai yells that she wants her daughter. She may not be as articulate as her husband, but she loves Malala just as much, and has clearly passed on a passion and outspokenness to her daughter. Malala circles back to describe her injury in more detail. After being shot, Malala is rushed to the intensive care unit, where a man named Colonel Junaid, who introduces himself as a neurosurgeon, tries to find the bullet in Malala’s body. Ziauddin is initially reluctant to entrust Malala to Junaid, because he seems young and inexperienced. Later, however, Malala learns that he is one of the finest doctors in the country, with more than a decade of experience. To Junaid’s surprise, the bullet is lodged in Malala’s shoulder, suggesting that Malala was leaning forward when the Taliban soldier shot her. The neurosurgeon orders CT scans and tests for brain damage. These tests determine that the soldier’s bullet has narrowly missed Malala’s brain. The aftermath of Malala’s shooting is a convoluted manipulation of politics as well as medicine. It’s a minor miracle that the soldier’s bullet didn’t hit Malala’s brain directly (though she’ll undergo some major surgery nonetheless), yet even so, it’s not clear how long Malala will have to stay in the hospital, or where she’ll be taken next. Even though we have a decent idea how this story will end (Malala is writing it, after all), she still maintains some suspense. In the evening of Malala’s first day in the hospital, Tor Pekai and Malala’s brother Atal arrive at the hospital. When they see Malala, they both begin to weep. They wait as Colonel Junaid orders more tests. He determines that, in spite of the fact that the bullet missed Malala’s brain, it’s likely that it caused splinters of bone to lodge in her brain, causing shock. Malala will require extensive surgeries to correct this serious problem. Colonel Junaid makes the decision to conduct the surgeries immediately, rather than move Malala to another hospital—a decision that ultimately saves Malala’s life. Despite his youth, Colonel Junaid shows himself to be a highly competent surgeon—indeed, he saves Malala’s life almost single-handedly. It’s strangely appropriate that the surgeon responsible for saving the life of Malala—a young, precocious crusader for women’s rights—is also young and precocious. It’s also important to note that it is only Malala’s fame that garners her this expert medical attention—the thousands of others killed by the Taliban didn’t have such luck. Colonel Junaid proceeds with Malala’s brain surgery. He uses a saw to cut away a small portion of Malala’s brain. This will allow her brain to swell in response to the shards of bone. For the next several hours, Ziauddin and Tor Pekai wait for news. Eventually, Colonel Junaid emerges from the operating room, saying that Malala will be all right. For the next three months, she’ll have to recover, but there will be no brain damage. We begin to see where the story is going: Malala will spend the next three months recovering from her injuries. Although the Taliban soldier was aiming to kill Malala, he’s only set her back three months—a hilarious feeble achievement, especially considering the fact that he’s also made her internationally famous as a martyr. Unbeknownst to Malala at the time, the Taliban almost immediately claim responsibility for shooting her. They insist that they attacked her because of statements she made the previous year about admiring Barack Obama—not because of her support for women’s education. The Taliban declare that anyone who opposes them will be shot, just like Malala. As the book goes on, the Taliban seem increasingly clumsy and incompetent. They now claim that they only killed Malala because of her statements about Obama—as if they realize that by shooting her, they only strengthened her influence regarding other causes. Following her surgery, Malala is visited by dozens of government officials and important journalists. General Kayani, the army chief, tells Malala that the entire nation is praying for her. Kayani arranges for Colonel Junaid to send the CT scans of Malala’s brain to the best medical facilities in the world, ensuring that Malala will receive impeccable treatment. Shortly afterwards, two British doctors, Fiona Reynolds and Javid Kayani (no relation to the army chief), arrive at the hospital. Kayani, working with the British government, has arranged for them to examine Malala. At times, it seems that the entire nation has turned against Malala because of her advocacy for equal rights. But at other times—now, for instance—it’s clear that Malala has broad, loving support from the people of Pakistan. It’s the same innate goodness that we glimpsed in the aftermath of the refugee crisis in the Swat Valley. Just as strangers took in refugees out of the goodness of their hearts, so many of the people of Pakistan support Malala. Doctor Reynolds and Doctor Kayani examine the medical facilities that Colonel Junaid has set up to treat Malala. They’re not impressed, and they point out to Junaid that Malala’s blood pressure needs to be monitored constantly. While they acknowledge that Junaid’s surgery was a complete success, they warn that Malala is not getting enough oxygen, and thus runs the risk of brain damage. Doctors Reynolds and Kayani raise the possibility of moving Malala to a better medical facility, possibly in another country. Reynolds and Kayani introduce a political element into Malala’s treatment. Although Colonel Junaid is a doctor, and thus is tasked with giving Malala the best treatment possible, the possibility of moving Malala to better facilities in a foreign country will have to be evaluated in political as well as medical terms. As Malala slowly recovers, Ziauddin refuses to leave the hospital. Nevertheless, he also continues to communicate with journalists and politicians in order to denounce the Taliban. While Malala is recovering, he receives further tragic news: a young woman named Arfa Karim, the youngest Microsoft-certified professional in the world, has died of a heart attack at the age of 16. Karim had spoken alongside Malala in support of education, and was a good friend of Ziauddin’s. The news of her death devastates him. Even when the entire nation is gathered around the TV for news of Malala’s survival, Malala notes that there are plenty of other people much more deserving of the nation’s sympathy. Only one of these (out of many hundreds) is Arfa Karim. Malala is selfless, even when she has every right to indulge in some selfishness. Arn, Jackson. "I Am Malala Chapter 21: ‘God, I entrust her to you’." LitCharts. LitCharts LLC, 2 Dec 2015. Web. 22 Apr 2019. Arn, Jackson. "I Am Malala Chapter 21: ‘God, I entrust her to you’." LitCharts LLC, December 2, 2015. 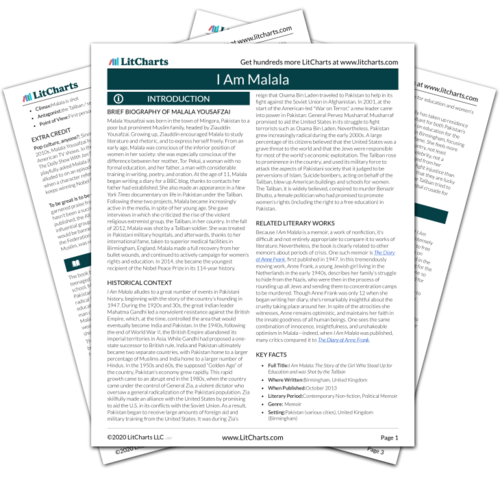 Retrieved April 22, 2019. https://www.litcharts.com/lit/i-am-malala/chapter-21-god-i-entrust-her-to-you.